It has been seven years since Richard Price last published a novel and it has been worth the wait. 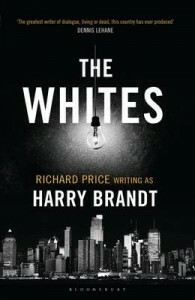 Writing under the transparent pseudonym Harry Brandt, Richard Price again demonstrates he truly is a master when it comes to crime and American life. Price delivers a multi-layered, slow-burning portrayal of friendship, justice and revenge and how easily the three of them can be incompatible. Billy Graves was a member of The Wild Geese, the WGs. A group of cops in the early 90s fresh into uniform and looking to make a difference on the wild streets of New York. Twenty years later he’s the only one still carrying a badge. The rest of his crew have successfully and unsuccessfully carved out new careers, all for different reasons and under different circumstances. But all of them are still haunted by their ‘Whites’. The cases that got away from them, where justice for one reason or many was never served. The cases they just can’t let go of, for the families of the victims and their own sense of right and wrong. Billy Graves is in charge of the Night Watch. The unit that responds to calls during the never glamorous night shift. He’s given the dregs of the department. The misfits and washouts, the cops nobody else wants to work with. He does his shifts and rushes home to get his two boys off to school before sleeping through the rest of the day. It’s life and it has it’s rhythm. Until he’s called to the scene of a stabbing where the victim is one of the WG’s ‘Whites’. When another ‘White’ is reported missing it is too much of a coincidence. As Billy picks around the edges suspicions quickly turn to betrayals. And when his wife and kids are targeted by a stalker it all suddenly gets too much for Billy. Operating on a severe lack of sleep and trust he grapples with what is the right thing to do while events slowly escalate around him. Richard Price not only has one of the best ears for authentic dialogue but also for the street. It’s noises and rhythms that ebb and flow around those whom inhabit it. He brings all his characters and their turmoils vividly to life with sublime nuance and empathy. Ultimately this is a story about the mistakes we make and how those mistakes and their consequences haunt us constantly. About how justice can be blind but vengeance can be all-consuming. If you let it.